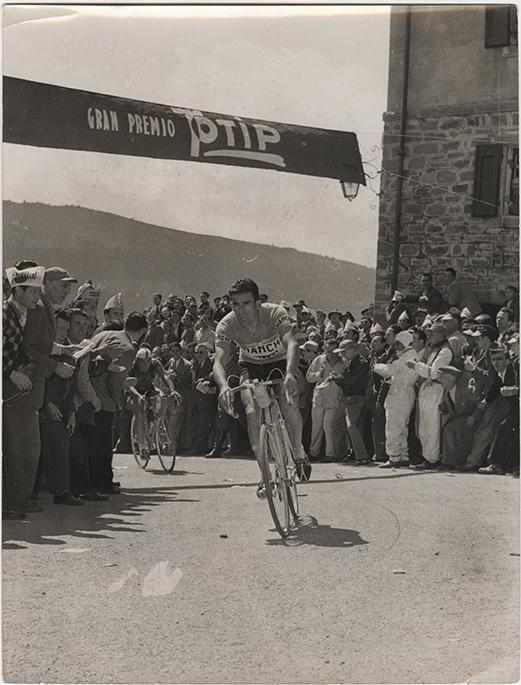 The Giro d’Italia 1952, 17th May-8th June, at its thirty-fifth edition, had twenty stages, 3.964 kilometres and was won by Fausto Coppi in 114h36’43” with an average speed of 34,586 km/h. 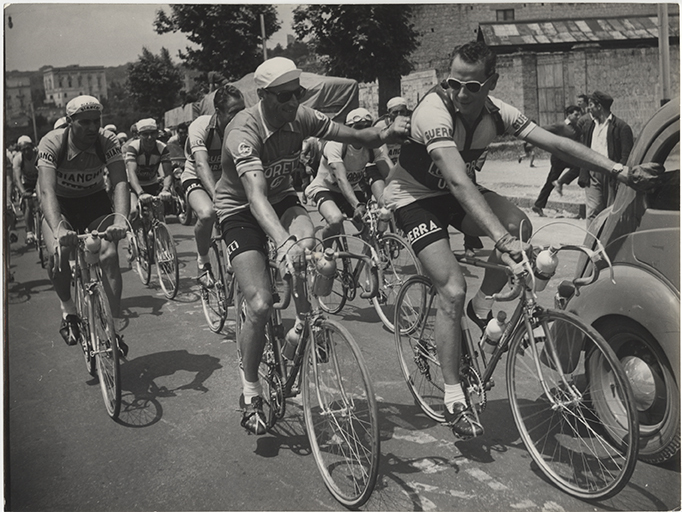 Fiorenzo Magni was second and Ferdinand Kübler third. 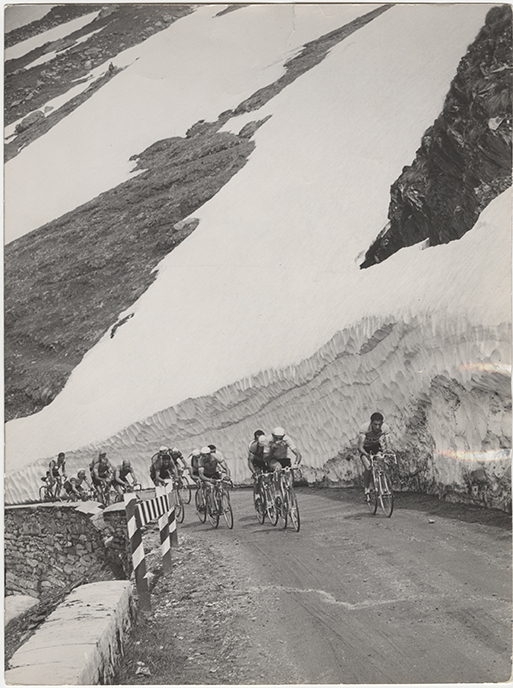 The field of racers was extremely valuable: next to Coppi, at the peak of his career, recovered after a series of injuries suffered over the previous years, there was Magni, Astrua and the old Bartali among the Italians, while Kübler, Van Steenbergen and Ockers were among the foreigners. 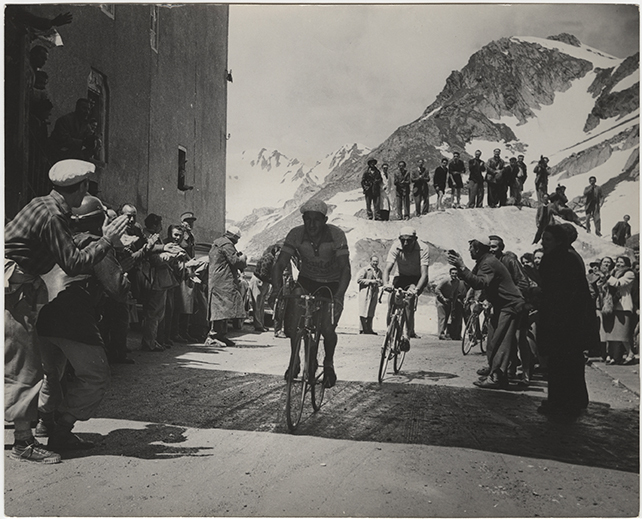 On the Dolomite passes of the Venice-Bolzano stage, Coppi gave his opponents the final blow. 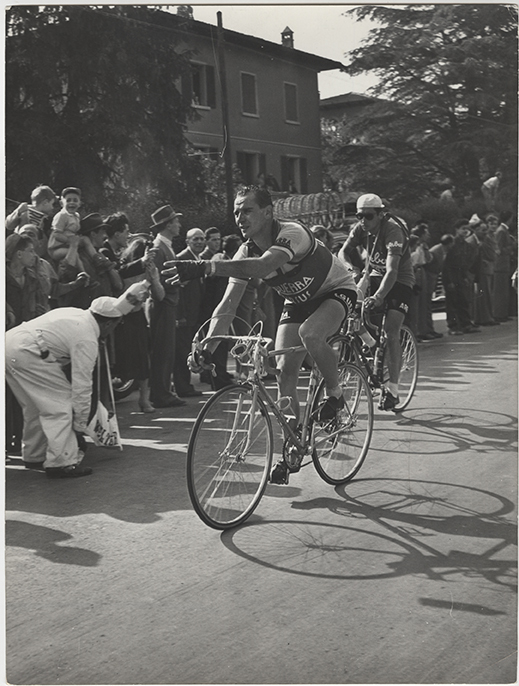 With his performance in the time trial from Erba to Como he put and end to the race and arrived in Milan with more than 9 minutes over Magni. Unfortunately, in the stage that went towards Rome, Orfeo Ponzin, an honest rider, fell badly and although he was immediately rescued, passed away without regaining consciousness. 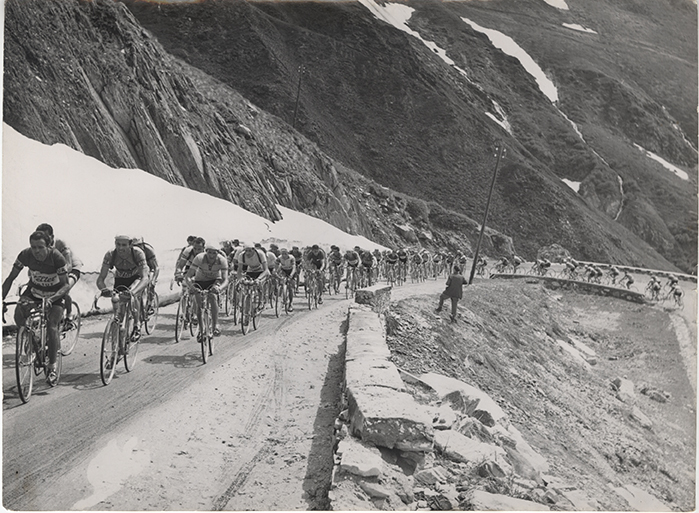 The next day, Pope Pius XII met the riders and prayed for the unfortunate Ponzin as he spoke words of encouragement and well-wishing for the Giro’s future. 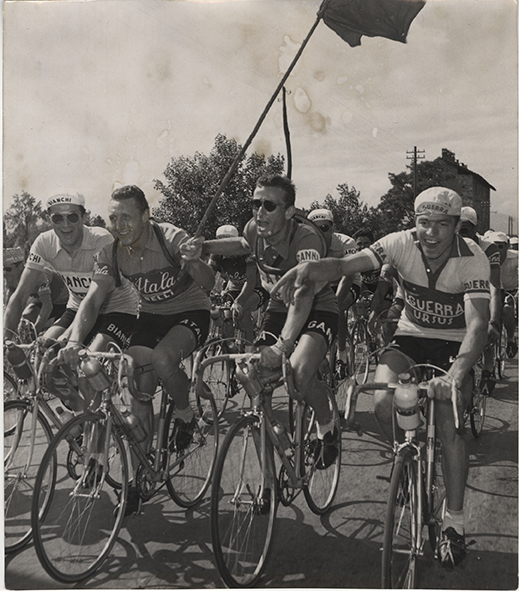 After Radio-Giro in 1951, the presence of a convenient telebus furnished telephone booths and a telegraph system and allowed journalists to quickly transmit data to their newspapers. 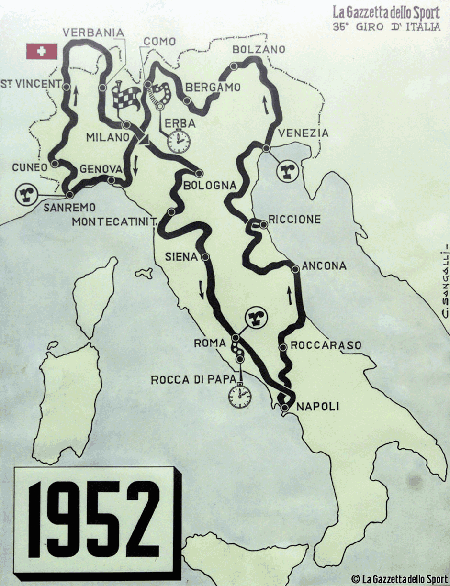 The 1952 Giro also established an initiative that would continue for several years: the evening show in the main squares of the cities of the stages, the “The Giro Show”, presented by Walter Marcheselli and with Maestro Giovanni D’Anzi as its artistic director, comedians and singers performed and all was enhanced by the presence of the Caravan’s advertising floats that distributed gadgets and free samples of their products.